High schools, colleges, cities and other organizations have a number of factors to consider when constructing a stadium: How many spectators are you accommodating? What&apos;s your budget? What other functions - like storage or concessions - do you want to address? All of these are important questions for the fundamental decision in your project: What kind of stadium structure should you choose? 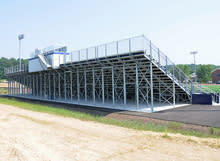 Southern Bleacher constructs support structures for venues and budgets of any size, and as with all our products, it&apos;s attention to detail that elevates our work to the top: end-capping materials for a finished look, the highest-level of safety considerations and air-tight project management.